Govern your life effectively and efficiently with the Apple iPhone 6s Plus. Various underlying technologies work in perfect unison to make this iPhone a device that performs tasks incredibly quickly. 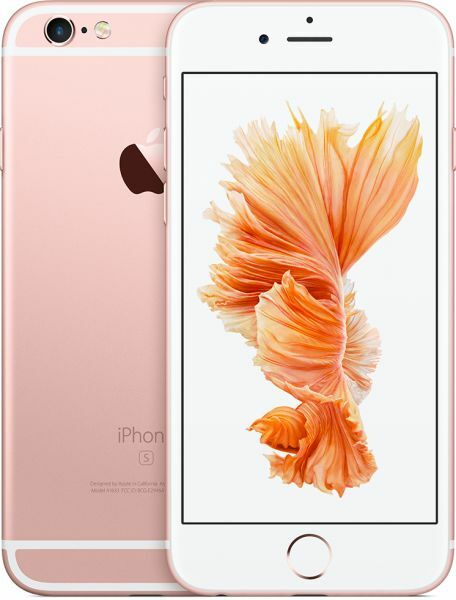 The iPhone 6s Plus redefines user experience, making doing things and living your life easier. The new 3D Touch functionality lets you do things incredibly quickly on the Retina touchscreen. Continually using the various features of this phone is intuitive because of the presence of iOS 9. The Apple A9 chipset lets you enjoy incredible performance on an everyday basis. An effective implementation of Voice over LTE lets this iPhone facilitate clear conversations. The new 12MP iSight camera incorporates many new technologies so that all you need to do to capture a great picture is click it. You can store and carry along great quality multimedia on this iPhone with a 128GB storage module. The casing of this phone is made from 7000 Series aluminum, and this ensures robustness. A proprietary Rose Gold finish makes this smartphone look gorgeous. The Apple iPhone 6s Plus implements a delightful new technology called 3D Touch that helps you get work done quickly as well as neatly. The touchscreen’s ability to accurately sense applied pressure is the hallmark of the new 3D touch technology, letting this phone behave in convenient new ways. Quick Actions, a new technology implemented in the iPhone 6s Plus, helps you conduct daily tasks with dispatch. The implementation of Quick Actions lets you perform common tasks straight from the icon by simply pressing it. Peek and Pop makes viewing emails, messages, websites, addresses, and such other content quick and easy. Lightly press an email within your inbox to “peek” or glance into its contents and apply a little more pressure to “pop into” or view the whole email. An A9 chipset powers the Apple iPhone 6s Plus, making it an incredibly capable device which you can to perform tasks with dispatch. The A9 chip features a 64bit architecture that lets it perform central processing tasks up to 70 percent faster and graphic processing tasks up to 90 percent faster compared to the previous generation. The A9 chipset incorporates an M9 motion coprocessor that handles, among other things, the accelerometer, compass, gyroscope, and barometer facilitating motion and fitness tracking. Siri is now constantly on standby for voice commands, letting you trigger tasks by calling out “Hey Siri” while your iPhone 6s Plus is about you. Capture the beauty of your family, friends, and the world about you with a click on the Apple iPhone 6s Plus. A 12MP camera, incorporating a variety of technologies, makes clicking pictures on this phone a delight. A new image signal processor, state of the art sensor, Focus Pixels, optical image stabilization, and enhanced local tone mapping make this camera easy to use. Live Photo functionality is implemented within this phone and automatically turns a precious picture into a precious moment with a seconds worth of video and audio. The Apple iPhone 6s Plus makes use of a brilliant Retina touchscreen to consistently cast lovely visuals. iOS 9 helps make using this smartphone on a daily basis easy by incorporating, among other things, a fantastic Notes app. This smartphone can easily switch between applications because it has a 2GB RAM module. You can store and carry along high quality multimedia, ebooks, comics, and games on this smartphone. Holding this phone, which measures 5.44 x 2.64 x 0.28inch and weighs 5.04oz, in the hand and interacting with it on a daily basis is easy. The Apple iPhone 6S incorporates a 5.5 inch Retina display that renders spectacular 1920x1080 pixel resolution images at 401 ppi. You can operate this phone with just one hand with room for your thumb to navigate through the device’s menu. Buy it especially is you like huge stuff !!!! !